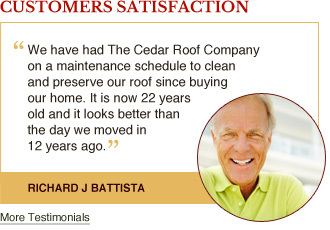 Homeowners with any type of roof can get the beautiful look of cedar without the maintenance. Cedar is a natural, beautiful and durable roofing material that can add value to a home with its many benefits. Certainly it is a classic choice used in the construction of some of the country’s oldest and most elegant communities, but cedar also offers some very practical reasons for its use. It is naturally rot resistant and able to withstand both wind and impact. With preservation it can last 50 years or more. Cedar is also a “green” choice: indigenous to North America, sustainably harvested, completely renewable and biodegradable. 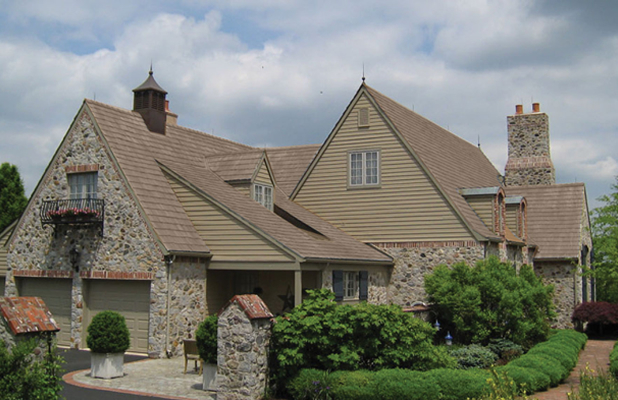 For more than 17 years local homeowners with wood roofs have relied on the experts of The Cedar Roof Company, in Malvern, to care for their cedar shake and shingle roofs, including preservation, cleaning, repair and installation. But for those who want to enjoy the charm of cedar on their home without the maintenance, there is an alternative. 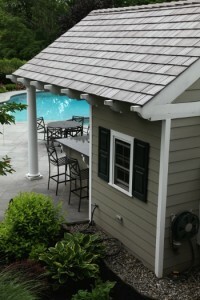 Enviroshake composite cedar roofing offers the curb appeal of real cedar. Enviroshake provides the performance and durability of a composite with an environmentally friendly blend. In fact, 95 percent of its roofing components are made using recycled or reclaimed materials, including natural wood fibers.nviroshake prides itself on its environmental practices. This beautiful home is complemented by the no maintenance look of a composite cedar roof. All of the post-industrial recycled materials used in its product are sourced from within a 300-mile radius of the manufacturing plant. Any scrap material it generates is recycled back into the system and the final product itself is recyclable, making it entirely cradle to grave. It is the only roofing product to have earned the Greener Product seal; a 4,000-square-foot Enviroshake roof saves three old-growth cedar trees and prevents 64 tires from entering a landfill. The specially engineered material includes additives to protect against ultraviolet rays, moss, mold and insects, though over time the natural wood fibers in the product allow it to achieve the same silvered gray color as weathered cedar. 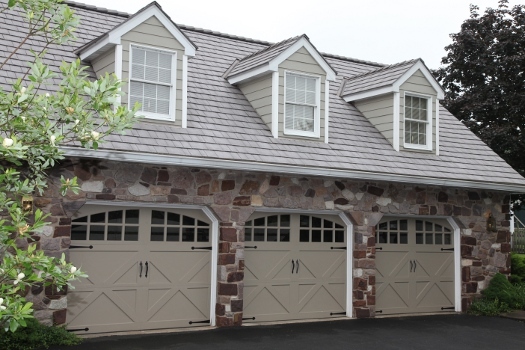 At the time of installation Enviroshake shingles are dark gray in color. After a period of three to nine months of exposure it is designed to undergo a change in color seen in naturally aging cedar. The roof will remain this color for the rest of its life; there is no additional fading because Enviroshake uses no color additives. Unlike real wood, however, Enviroshake comes with a lifetime warranty for the original purchaser or a 50-year warranty that can be transferred to the new buyer in a home sale. 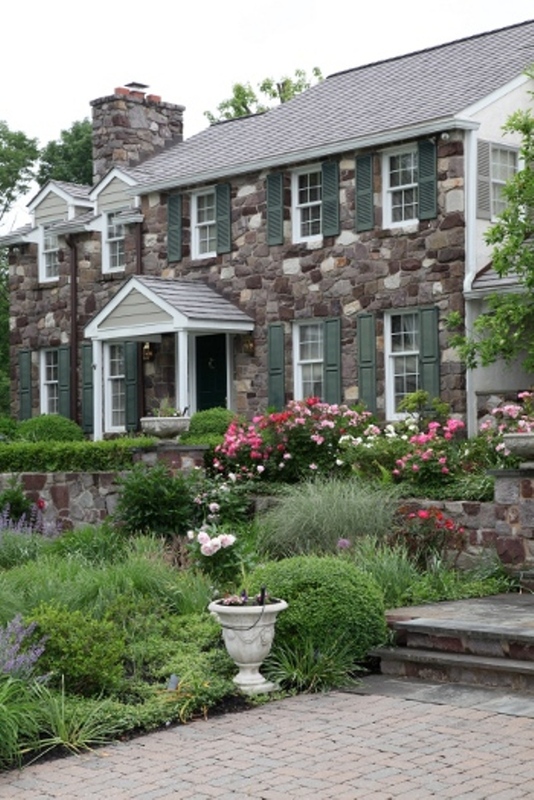 Enviroshake is a lasting investment that will increase the resale value of a home and provide homeowners with 70 to 80 percent return on investment. In order to maintain the quality of installation needed to offer such a guarantee, the product must be installed by a certified company. Enviroshake certified installers must meet its strict requirements for training, insurance, workmanship and warranties. The Cedar Roof Company is a certified installer of Enviroshake products, having undergone extensive training and certification from the manufacturer. The company is also a member of the Pennsylvania Better Business Bureau, with more than 2,800 active customers and membership in local business and industry organizations. Enviroshake is available in eight different profiles that have been made using three-dimensional images of natural hand-split cedar shakes to ensure a realistic wood grain texture, shingle size and appearance. These options can provide either a uniform appearance or a more natural random effect. Malone says, “It is easy to work with and is well designed for ease of installation, while appearing to exhibit the natural variations of real cedar.” Its authentic look and durability have made Enviroshake the material of choice for prestigious mountain ski resorts including Sugarbush Resort in Vermont and Banff Park Lodge in Canada. It has even been used for such historic restoration projects as the Henry David Thoreau House, originally built in 1730. No matter what type of roof is currently installed on a home, it can be replaced with Enviroshake, a product that offers the beautiful look of cedar without the maintenance. "; //content += "Aspect Ratio:"+obj.aspectratio+"
Colors depicted for comparison purposes only. 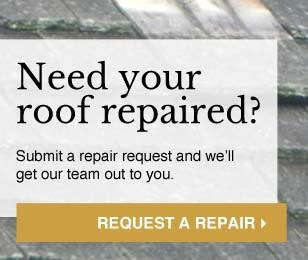 Actual preservation color may vary based on the condition of wood roof. Please refer to the Gallery for more representations of colors.